Newcomers are always welcome - and we'll teach you how to knit and crochet prayer shawls! We meet on the first Tuesday of each month, 7:00 to 8:30 pm in the Main Foyer from September until June. Bring your knitting needles or crochet hooks and join us as we create prayer shawls for people going through difficult times and blocked blankets for people in need. 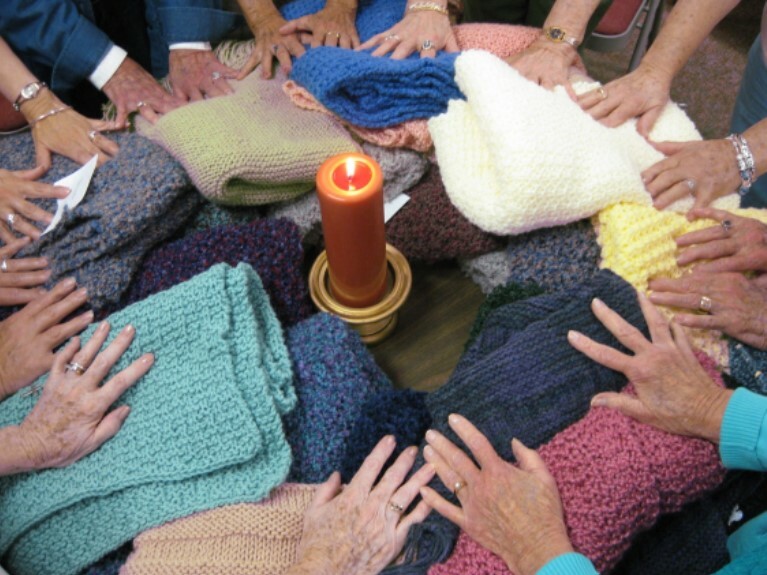 Prayer shawls that have been completed are brought to our monthly meeting, where we lay hands and bless them (photo). Then, they are ready for presentation to people within our congregation and community who need to feel Jesus warmth and love wrapped around them. Our beautiful ministry is led by 3 dedicated women ~ Dee Johnson, Joy Good & Susan Long. For more information, call the church office 215-723-3088.